Used Allsteel Terrace cubicles in 7×6, 7×7 or 7×8 configurations. Several larger cubicles are available. Each used Allsteel cubicle comes with a BBF (2 drawers, file), 30 inch 2 drawer lateral file cabinet and a 48 inch overhead storage bin. Each overhead bin has a task light underneath. The fabric on these used workstations is a beige tone. The work surfaces are maple laminate. 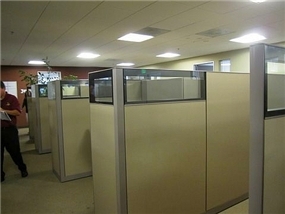 Our used Allsteel Terrace cubicles are in great shape, rated 4 of 5. You can view them on site until then. The price does not include delivery and installation.